Until recently, morse code proficiency was a manditory part of every license examination, but since it was dropped as a requirement by the FCC in 2007, this mode of radio communication has taken on a new life. Many thought it would simply disappear, but morse code, now that it's being taken up out of interest instead of being a burdensome requirement, is steadily gaining new fans. To the uninitiated it may seem awkward to communicate by spelling out your words with dits and dahs, but to the practiced code operator it isn't even necessary to write down the messages. They can decode the individual letters as well as entire words in their heads as they hear them. Using short hand and Q-signals to speed thing up, some can transmit and receive code at 20-30 words a minute. 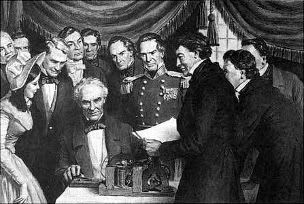 In 1836, American, Samuel Finely Breese Morse (1791-1872), was the first to prove that information could be transmitted over wires. Eight years later, before Congress, Morse demonstrated the long range capability of telegraphy when he transmitted the famous message “What hath God wrought” over a wire from the B&O's Mount Clare Station in Baltimore to the Capital Building, in Washington, (a distance of 38 miles). Annie Ellsworth, who's father, U.S. Patent Commissioner, Henry Leavitt Ellsworth, championed Morse's invention and secured early funding for it, chose these words from the Bible (Numbers 23:23). Morse, a well-know portrait artist, and founder of the National Academy of Design, became interested in electricity in the mid 1820's, and spent the next decade perfecting his version of the electric telegraph, which earned him the first patent for this type of device. The information in telegraphy is sent as a series of electrical signals. Short signals are referred to as “dits,” (represented as dots), and long signals are referred to as “dahs,” (represented as dashes). The code relies on precise intervals of time between dits and dahs, between letters, and between words. A dit is one unit of time, while a dah is three units of time. The proper space between letters is 3 units, while the space between words is 7. 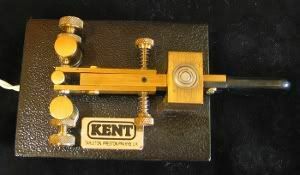 Morse code transmitting speed is measured in words per minute (or WPM). The word “Paris” is used as the standard length of a word. If you transmitted the word “Paris” 5 times (which requires 50 units of time), you’d be transmitting at 5 words per minute. In the early 1890's, the Italian inventor, Guglielmo Marconi began experimenting with wireless transmissions of morse code, gradually increasing the range of his transmissions from being measured in mere meters to distances of several hundred kilometers. Although Marconi was not the only one experimenting with radio, (Nikola Tesla was another), he was able to improve the technology to a point where it became useful both commercially and militarily. In the early 20th century, the first practical applications for radio telegraphy was with maritime communications. It was seen as a replacement for the centuries-old practice of signaling by flags, lights, and foghorns. 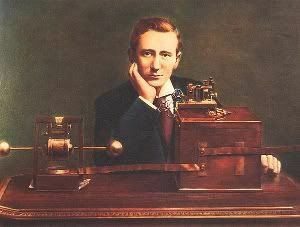 Marconi's greatest achievement came on December 12, 1901, when he received a message sent from England at St. John's, Newfoundland. It was the first Trans-Atlantic radio contact. Thomas White, in his article, “United States Early Radio History,” stated that the new technology, “greatly reduced the terrible isolation of ships during emergencies, and was quickly responsible for saving thousands of lives." 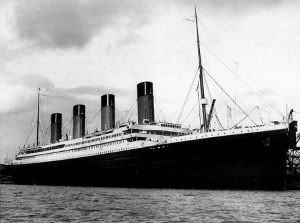 Shortly after the Titanic disaster in 1912, the International Convention for the Safety of Life at Sea convened, and produced a treaty in 1913, requiring shipboard radio stations to be manned 24 hours a day. Stations at the time consisted of spark-gap transmitters, which used a rotating commutator with 6-12 contacts per wheel, driven by about 2000 volts DC. As the gap made and broke contact, the radio wave was audible in a magnetic detector at the receiving station. These were eventually replaced by continuous wave transmitters (inspiring the short-hand name CW for wireless telegraphy). 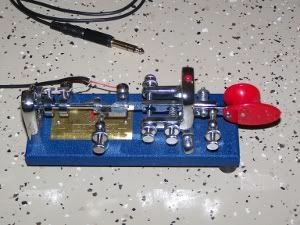 Morse Code is one of the simplest modes that can be used to make radio communications over long distances, and it doesn’t require complicated transmitting or receiving equipment to get on the air. Some of the advantages of CW are it’s ability to override noise and static and still make itself readable, along with it’s ability to occupy only a fraction of the bandwidth of radio telephony signals, and it’s universal nature. 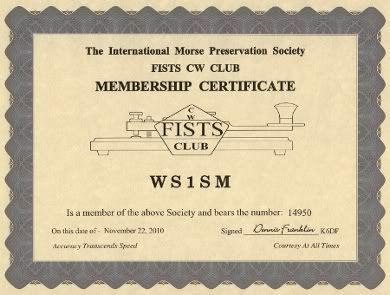 John Desmond writes in his article, “The Advantages of CW,” that, “no matter who you are talking to in the world, you can complete a contact on CW.” That’s because there’s a series of internationally recognized Q-signals and short-hand terms that are understood by any ham radio operator in the world. When you give a signal report of “five and nine” using phone, the receiving party’s ability to understand English will determine whether or not the message gets across, but using CW, a report of 5 9 9 always means the same thing. Another advantage of CW is the fact that a QSO can take place in a bandwidth of about 300 Hz, compared to 2.5 KHz for SSB, and up to 10 KHz for FM. This means you can fit a lot more QSO’s into a given bandwidth, which is especially important on some of the HF bands, where there is sometimes very small portions allocated for CW. In addition, because you are tuning in a signal on a narrow piece of the band, it makes it a lot easier to filter out interference. Although ham radio equipment has become extremely advanced over the years, there isn’t much required to make contacts using CW. All you have to do is to generate a carrier and turn it on and off. Because of its cost effectiveness, you’ll hear stations on CW that you’ll most likely never hear on any other mode. CW equipment can be easily built by most prospective hams. In fact, an entire group of Amateur Radio enthusiasts specialize in building and using very simple, low powered stations (known as QRP, in ham radio parlance). There are thousands of QRP enthusiasts around the world, who, for only a few tens of dollars, construct and operate their entire station, including antenna, transmitter and accessories. 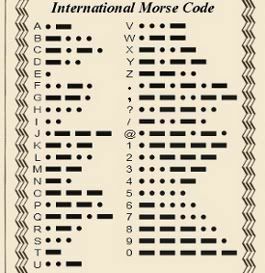 Morse code remains the simplest and most efficient way known to send messages via radio. Messages can be sent with less transmitter power than by any other method (except for ultra-complicated "spread spectum" systems, which are expensive, difficult to construct, and beyond the reach of the average ham). 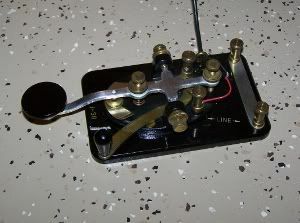 Morse code signals will also penetrate interference, both natural and man-made, better than most complex modes. 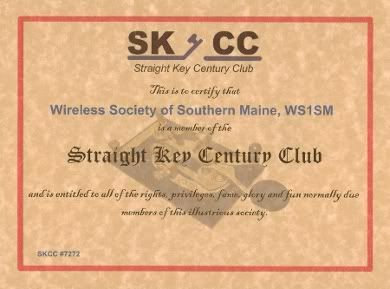 In fact, when band conditions are poor, CW is often the only way to make DX contacts. A straight key was the first type of telegraphy key used, and it has stayed true to its original design for more than 150 years. The key is made up of a hinged bar with a knob on top and a contact underneath. When the bar is depressed against spring tension, it completes a circuit, thus allowing the operator to send a message. In the late 1840's, straight keys were used by railway systems, internal government agencies, and for public communications. The key is simple and reliable, but transmission speeds are limited to around 20 words per minute. 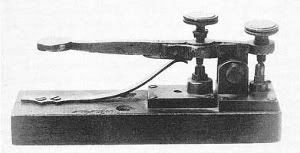 Around the turn of the 20th Century, as Morse sending speeds increased, many operators wanted a faster sending key. Transmission speeds were limited on a straight key, and repetitive stress injuries such as “Telegrapher’s Paralysis,” or “Glass Arm,” was common among those who sent high speed code on straight keys for long periods of time. The answer was the “bug,” which used a vibrating steel arm to automate the sending of dots. 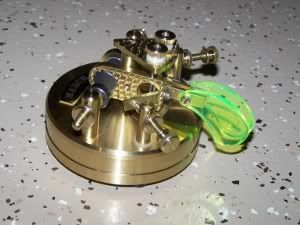 The bug, or semi-automatic key, is operated by the side-to side motion of a lever, that if pressed to the left creates a “dah,” or dash, and if pressed to the right, activates a vibrating arm to create “dits.” The “bug” was first popularized by the Vibroplex company and is often called a Vibroplex, regardless of the manufacturer. Several companies created their own designs, including Lionel, Dow, (which made a rotatable bug), Speed-Ex, McElroy, and others. The bug allows a skilled operator to send at speeds of up to 40 words per minute. The Sideswiper, or “Cootie Key,” is another alternative to the straight key. The Sideswiper was the first to use a side-to-side motion, and its action is considered faster than that of a straight key. More than anything, it made sending code more comfortable. The design is basically that of a SPDT switch with a return-to-neutral feature that assures your carrier doesn’t remain on the air between dots and dashes. According to John Myers, in his article Modernization of an Old Favorite, what “sets aglow the warm feeling many of us have for the sideswiper is that it gives character to one’s fist. Such character isn’t achievable with modern keyers by any but the most dogged - and it’s impossible with a keyboard” (Myers). There is a mechanical limitation, though, to sending high speed code. This was answered by electronic keyers, which make use of electronic circuits to automatically generate dots and dashes. An iambic paddle uses electronics to create exact separation between dashes and dots. Because of this, a paddle, electronic keyer, (which translates the paddle’s movements into Morse code), and a transmitter are required. 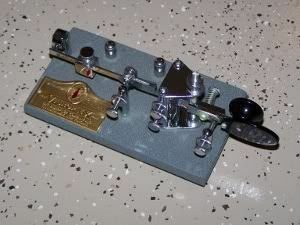 Most modern HF rigs have built-in keyers, so a separate one is not required. Although paddles come in either a single lever or dual lever variety, the dual lever paddles are most common. Paddles have two separate movements and sets of contacts, and are operated with a gentle side to side motion. Because there’s no mechanical vibration to create the “dits,” it doesn’t require much force to used one. Chuck Adams writes in is article, Using an Iambic Paddle, that “Just a light touch is all it takes if you have it adjusted correctly. If the paddle moves around on the table while you’re sending then you are using too much force,” and finishes the by saying, “Take it easy. It isn’t going anywhere on its own.” One of the benefits of the iambic paddle is its ease of operation, which along with the exact spacing allowed by the electronic keyer, increases operating speed tremendously (Adams). Some popular iambic paddles include the N2DAN Mercury (now manufactured by Bencher), Bencher’s BY-1, M0AGA’s Chevron, and paddles produced by UR5CDX (Ukraine), and Begalli (Italy). 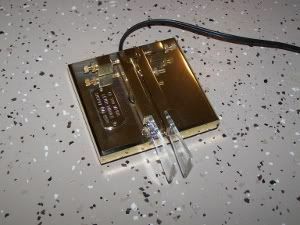 Between 1940 and the mid 1960's, electronic keyers made steady progress. 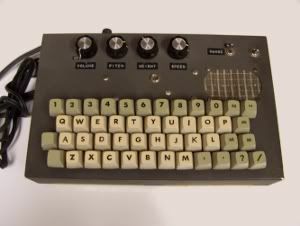 In 1940, W2ILE created an electronic bug, which used a thyratron to generate automatic dots and dashes. Later came a tube-based design by Jim Ricks, W9TO, which allowed code to be sent by paddles up to 65 words per minute. Several solid state designs followed, but CW operators could not reliably send accurate code at speeds above 50 words per minute. The next step was a departure in traditional telegraphy - the keyboard. As the name infers, sending by this method is done by “typing” on and actual keyboard that is connected to a stand-alone “box” or computer. The self contained units include the keyboard and the electronics needed to generate the code elements. Many just plug into the key jack of you transmitter. MFJ manufactures a keyboard keyer interface that goes between a keyboard and a transceiver, and there are also software programs such as FL Digi, and CW Type, which puts your PC between the keyboard and the rig. Many high speed CW enthusiasts enjoy operating “QRQ” using their keyboards to transmit from 60 to over 100 words per minute (Gerry). Gerry, Joe. "QRQ (High Speed) CW." CQ Amateur Radio. Vol. 66. No. 9. September 2010.